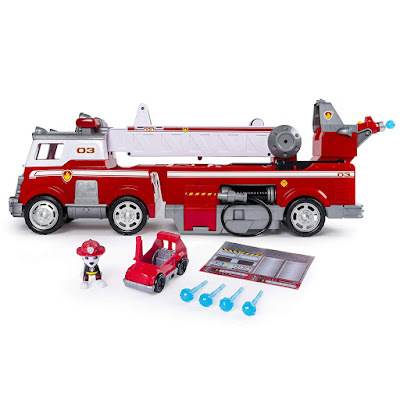 Hurry over to get this PAW Patrol - Ultimate Rescue Fire Truck with Extendable 2 ft. Tall Ladder for ONLY $44.44 (Retail $59.99)! An ultimate rescue needs an ultimate vehicle! Save the day with Marshall's Ultimate Rescue Fire Truck! This vehicle is equipped with an extendable 2 ft. tall ladder, flashing lights and sounds – it's ready for anything! To activate, simply lift and pull! The adventure begins with Marshall (figure included) in the lookout cab. Lift open the top to help Marshall leap into action! Using the water cannon launcher at the bottom of the cab, you can send up to three water cannons (included) flying into the fire! When Marshall needs a helping paw, there's room for all six pups (not included) aboard this fire truck! With Skye behind the wheel and Zuma operating the water cannon at the back of the truck, Marshall can hop into the Mini Fire Cart! Stored inside the fire truck, the Mini Fire Cart rolls right into action! The Ultimate Fire Truck also features a mini fire hose for small missions. When you and Marshall spot a baby animal in trouble, use the extendable working claw arm to pick them up and lift them to safety. Take the pups on exciting new adventures with the Ultimate Rescue Fire Truck!